Derby-based special educational needs (SEN) sixth form students have joined Midlands contractor G F Tomlinson, Ashbourne Road District Allotment Association (ARDAA) and BBC Radio Derby’s ‘Potty Plotters’ on a community volunteering project at Ashbourne Road Allotments. The community project, which is being delivered by volunteers from G F Tomlinson, will see the creation of five, quarter-sized ‘starter plots’ for those new to allotmenteering as well as the creation of communal rest and composting areas. Ashbourne Road Allotments cover 130 plots across nine acres and the new, smaller starter plots are designed to be easier to manage and maintain for those new to the hobby. G F Tomlinson volunteers are donating their time to erect fencing, create pathways and support the groundworks to create the new plots, which new gardeners will be able to use for a year before moving on to a full-size allotment. In keeping with ARDAA’s green ethos of re-use and recycle, G F Tomlinson is up-cycling old paving slabs and fencing for the Ashbourne allotments from a project being delivered via Scape’s Regional Construction framework at the nearby Brackensdale Primary School. The G F Tomlinson team will work with the Year 13 students from Horizons 6th Form, part of St Martins School, to create the plots by Spring 2019, just in time for the start of the growing season. 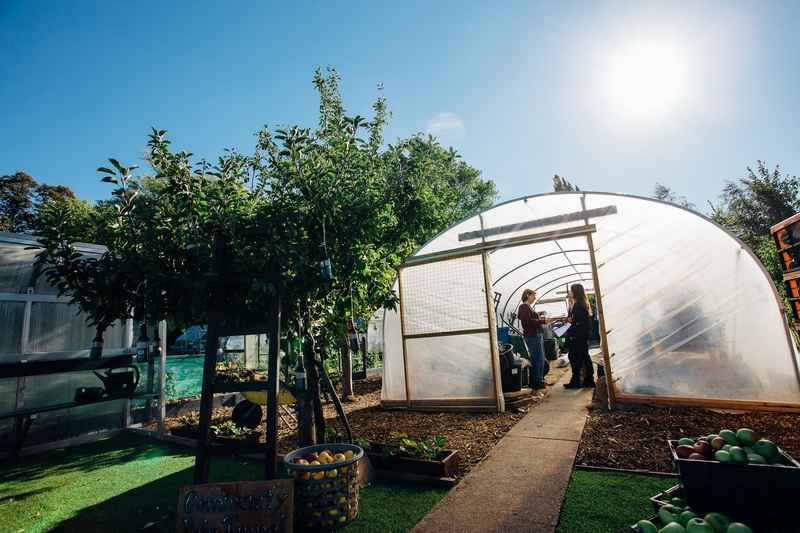 This will give the students the opportunity to learn new skills and enjoy some of the benefits of allotment gardening while giving them valuable real-life work experience as they work towards a level 1 Prince’s Trust qualification during the venture. Once the plots are complete, ARDAA will use the recently completed ‘Growing Academy’, which was created using materials donated by G F Tomlinson, to continue educating new and existing allotment users and local residents about the benefits of gardening and growing produce. The project follows G F Tomlinson’s work with ARDAA in 2017 when they helped transform a disused plot at the allotment into a new Centenary Garden – a dedicated area for people with disabilities or recovering from illness. The garden provides a calming, community space for allotment users and the local community and is used by children at Derby-based Whitecross Nursery School, who visit fortnightly to explore the garden and get involved with small projects such as helping to make hedgehog tunnels and ‘bug houses’. “This project brings together plot-holders and local students in the spirit of community integration and is another example of the lasting legacy G F Tomlinson delivers through Scape’s Regional Construction framework. “We look forward to continuing our work with ARDAA and supporting the students from Horizons 6th Form. We are fortunate that our ongoing partnership with ARDAA allows us to engage with local students in new and exciting ways. Elaine Crick and Julia Slater, also known as the ‘Potty Plotters’, are active gardeners from ARDAA and the driving force behind the starter plots who share their knowledge of gardening on the BBC Radio Derby Andy Twigge show on Wednesday afternoons. “We know the pleasure and satisfaction derived from successful growing and have both enjoyed hours of fun on our plots. The starter plots are a great concept, giving the beginner allotmenteer every opportunity to learn and fully enjoy their own growing space whilst developing the confidence, skills and knowledge to move forward. “This is a fantastic opportunity for our students, they will be developing lots of transferable skills including elements of construction, horticulture, teamwork and also raising levels of social skills by working with new people. “It will not only lead to a memorable and enjoyable experience, it will also mean the students will achieve a level 1 Prince’s Trust qualification which will help build an impressive portfolio when applying for jobs in the future.